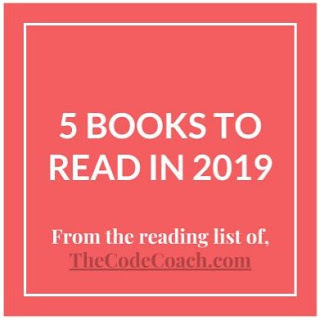 Click here to see past years lists. I hope that 2018 brought all that you hoped it would. 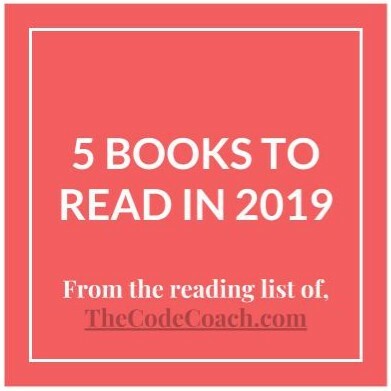 As we wind down the year and look toward 2019 here are the top 10 most viewed posts from TheCodeCoach.com. I could really use your help, right now. In an effort to make this blog more relevant to your needs and interests I have created the 2018 Reader Survey. Your input is important to me. The survey is less than 12 questions, and should take less than 5 minutes. Also, there are no 'required' responses to hang you up. Several years ago our department was seeking to transition from paper files and inspections to an all digital solution. I presented several software options, but in the end, I was told that we already pay for Target Solutions, can we make that work for inspections? I did not know the answer to that question, as I had assumed that Target Solutions was only a training software program, however, as I began to search through and experiment with its other features, I quickly realized that it was a good fire inspection solution. The key to making this work for your department is in the proper utilization of the ‘Activities Builder’ feature of the program. 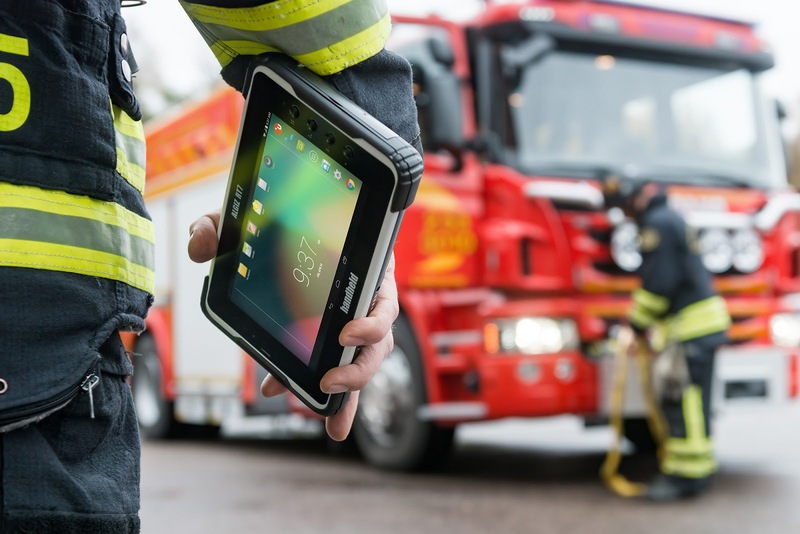 Knowing how to use the ‘Activities Builder’ can provide a viable solution for digital, cloud-based fire inspection activities. The below guide will walk you through how to set-up a custom inspection checklist that may fit your departments needs. Log in to your Target Solutions account. If you have not done so already, you will need to create a ‘category’ for your inspection activities. On the right side of the screen in the highlighted area labeled ‘Categories’, select ‘Add New’. Insert category name, and select ‘submit’ to save. Select ‘Create New Activity’ (green button in the top right hand corner of the screen). Select or deselect desired ‘Options’. You may also want to ‘Require validation upon completion’ this will allow an administrator to review the report and reject or request changes. ‘Certificate’ is not normally required for an inspection document - this is primarily for custom activity training classes. The next screen that appears will be the start of your form. The title of the form (that was given to it in the step above) will be in the top title bar. The description will be in a text box below that. The next step in building your inspection form is to add various components. Components that may be used are located in the right sidebar. These can be added by simply clicking on the title and completing the information as prompted. For inspection forms we will only need to utilize a few of these components. You will notice that each of these components will have a checkbox labeled ‘User response required’. If this is checked it will prevent the form from being submitted until that component has been completed. It is advisable to select this option for inspection activities, as this can serve as a reminder to the inspector of items that need to be addressed. Select ‘Units Involved’ - This is a good selection to identify the units or individuals conducting the inspection. In the question box you could enter, ‘Personnel conducting inspection’. Select ‘Location’ - this is where the property address or identification can be entered. Select ‘Request File’ - this allows inspection pictures or other documentation to be uploaded and attached to this specific report. Next we will need to add some ‘Free Form Components’. The ‘Question’ component will be utilized most frequently. Text - allows user to enter small amount of information, anything that can be typed from the keyboard. Long text - the best option for items that may require a longer explanation, or narrative material. I usually end my forms with the long text box so the inspector can provide a full narrative of any issues or deficiencies. Repeat this process as necessary to account for all required inspection items. The form auto-saves as it is being created. When you are done, you should click the eyeball icon (top right corner) to preview the form. Make changes as needed. The great thing about using Target Solutions for fire inspections is that it is fully customizable, provides data output in a variety of outputs (.xml, .pdf, etc. ), and since it is cloud-based, is instantly accessible from anywhere. Although, there are other software programs available specifically for fire inspections, for departments currently using Target Solutions for training, this can be an added value received from the program. You may also like this article on how to use Target Solutions for regulatory audits. With the record breaking and devastating wildfires in California, private fire protection services are becoming more visible. These services are offered by insurers, such as AIG and Chubb, to add an extra layer of protection to their high value insured properties. Much of the media seeks to vilify the “rich” for engaging in this practice. However, as any of us would, we merely use the tools at our disposal to reduce our exposure to loss. 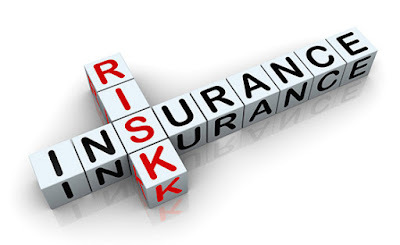 The most succinct definition of risk comes from NFPA 1250, “a measure of the probability and severity of adverse effects that result from an exposure to a hazard”. NFPA 1250, Recommended Practice in Fire and Emergency Service Organization Risk Management, provides this definition of risk, and outlines risk managements plans and processes that should be implemented by fire departments. Understanding that risk is an inherent part in our daily duties, there are five techniques that can be employed to manage or control this risk. Exposure Avoidance. This is risk control by simply opting out, and steering completely clear, of a particularly high hazard activity, event, or location. Loss Prevention. This is the use of methods and measures to reduce the probability of a loss from occurring. 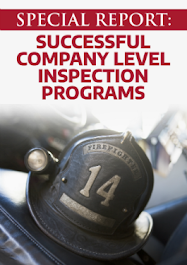 These can include inspections, audits, or training programs. Loss Reduction. Theses are measures used to reduce severity of loss, even if engaging in a high risk activity. A good example would be the use of PPE when entering a structure fire. This would also include post-accident/loss activities, procedures, and processes. Segregation of Exposures. This could also be a loss reduction tactic. This is accomplished by breaking large units into smaller ones, and distributing equipment and resources, throughout a large area. This reduces the likelihood of a total loss if all items, personnel, resources were to be located in a single area. Contractual Transfer. This is the use of a formal insurance policy. This is affected by the transfer of responsibility from one entity to another. These five methods of risk management are defined and outlined in NFPA 1250. The insurance industry, however, would add one additional method to the list - retention. Retention. This is when an organization acknowledges that there is a risk, and prepares for the loss (financially and physically) themselves. They are self-insured, which simply means that they control all the money, instead of an outside or third-party “insurance company”. As fires continue to rage throughout California, investigations into the twelve fires that occurred earlier this year, and burned 245,000 acres, have been concluded. 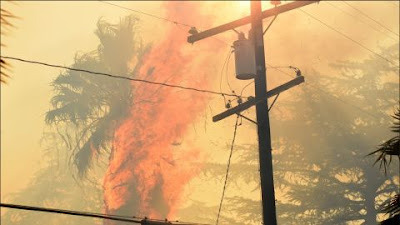 Investigators with Cal Fire have determined that these fires were caused by Pacific Gas & Electric Company power lines. High winds in the area caused trees and branches to fall onto the lines, and in at least one case a power pole failed and collapsed. PG&E currently has a vegetation control program in place with a budget of $400 million per year. NFPA 1, Fire Code provides clear guidance on how to prevent fires from electrical lines. 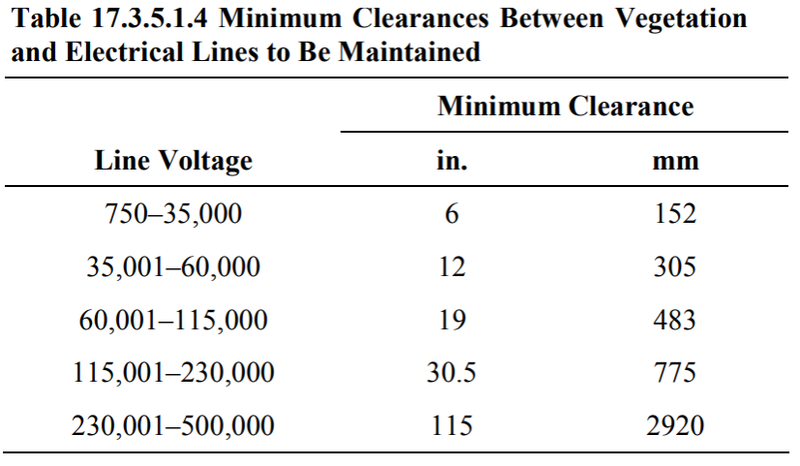 Chapter 17, Wildland Urban Interface outlines the following requirements for vegetation clearance around electrical transmission and distribution lines, conductors, and their appurtenances. 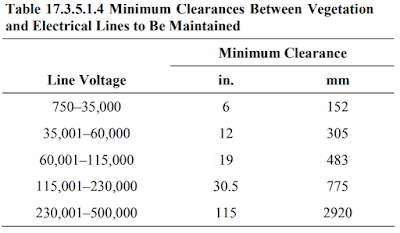 As the growth returns, it is permitted to grow to within the clearances shown in the table below. Once this minimum distance is reached vegetation must be trimmed back to the required minimum clearance. Though many jurisdictions have electrical inspectors that enforce the provisions of NFPA 70, National Electrical Code (NEC), there are provisions and requirements that overlap with the duties of the fire inspector. 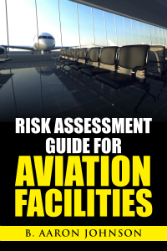 Some of these areas or occupancies include high hazard industrial facilities, paint rooms and spray booths, hazardous materials storage, and fuel handling processes and operations. These areas require that the fire inspector properly classifies the hazardous location in order to ensure proper installation of electrical wiring and components. NFPA 70, Article 500 defines these hazardous classifications as follows, “Locations shall be classified depending on the properties of the flammable gas, flammable liquid–produced vapor, combustible liquid–produced vapors, combustible dusts, or fibers/flyings that could be present, and the likelihood that a flammable or combustible concentration or quantity is present. Each room, section, or area shall be considered individually in determining its classification.” These are divided into classes and divisions. Class I - locations in which flammable gases, or flammable or combustible liquid-produced vapors are or may be present in the air in quantities sufficient to produce explosive or ignitable mixtures. Class II - locations that are hazardous because of the presence of combustible dust. Class III - locations that are hazardous because of the presence of easily ignited fibers, or where combustible flyings are handled, manufactured, or used. The charts below show the Class and Divisions categories. Download the "NEC Hazardous Locations - Quick Reference" sheet here. *Group E. Atmospheres containing combustible metal dusts, including aluminum, magnesium, and their commercial alloys, or other combustible dusts whose particle size, abrasiveness, and conductivity present similar hazards in the use of electrical equipment. In some instances a “zone” designation may be used as an alternative to the division classification system shown here. These zones will either be Zone 0, Zone 1, Zone 2, or Zone 20, Zone 21, Zone 22. These are defined in NFPA 70, Article 505 and Article 506. As a tool for the field inspector or plans examiner we have created a single page reference that provides quick access to the classification and division definitions. In the 1940's, Sherman Kent, a Yale professor and father of American analytical intelligence, authored a book entitled, Strategic Intelligence for American World Policy. In his book, written for intelligence analysts, Kent outlines nine rules of analysis. Though written for the intelligence community, these nine rules of analysis can be applied to what fire protection professionals do everyday. As fire protection professionals we are constantly faced with a barrage of data and information. This data and information must be analyzed and evaluated to specify and approve life safety features, design fire protection systems, promote and develop prevention programs, and more. How can we ensure that the right information is being analyzed and the best options are being presented? To be great at the art and craft of analyzing and presenting information, we should learn and apply Kent's nine rules of analysis. 1. Focus on Policymaker Concerns. Who are the policymakers in your community? What is their primary concern? The "policymaker" can be the client, the commissioners, or other group or individual that will be making the final approval decision and releasing needed funds. Issues and requests will be better received if presented in a manner and time-frame that suits the affected policymaker. "Accommodate clients by producing assessments timed to their decision cycle and focused on their learning curve". 2. Avoidance of a Personal Policy Agenda. What is best for the policymaker (client,group, community)? This may directly conflict with the needs of the individual, the department, or the company. "Identify and evaluate alternatives...allow the client to recommend and choose." 3. Intellectual Rigor. Information and solutions should be "rigorously evaluated for validity". "Judgments are based on evaluated and organized data, substantive expertise, and sound, open-minded postulation of assumptions." 5. Willingness to Consider Other Judgments. Argument and dissent should be encouraged, as long as, the dissenter's judgement is made clear and based on alternative assumptions or different interpretations of information. A good example of this is the model code development process. A group of individuals that gather, share their "judgments", to create the most useful and relevant code or standard. 6. Systematic Use of Outside Experts. The more we know about new technology, new processes, new structure or building methods, the better we can serve those "policymakers" and our communities. This can be largely accomplished by building the right relationships with experts in other fields, that can provide and interpret the new information. "Take account of a wide range of outside opinions...cultivate working relations with outsiders..."
7. Collective Responsibility for Judgment. Collective responsibility is the idea that individuals who are part of of a group (the "collective") are responsible for the groups actions and occurrences by tolerating, ignoring, or harboring them, without being actively engaged in the decision. Being aware of this, fire protection professionals should always speak up, represent, and defend their analysis, to their clients best interest. "Allow time for coordination and accommodate collective responsibility." 8. Effective Communication of Policy-Support Information and Judgments. A good method to use is The Pyramid Principle developed by Barabara Minto. This is a method of corporate communication that starts with the solution then presents recommendations, and supporting ideas. "Shorter is usually better, with key points stated quickly... 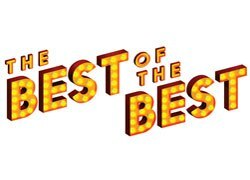 If the tradeoff is between adding length and allowing brevity to cause confusion, provide a carefully measured dose of detail." 9. Candid Admission of Mistakes. If you have made a mistake readily admit it and present solutions for corrections. Master your subject and trade-craft, study mistakes, learn by conducting a critical review of failures. "Admission and explanation of analytic errors are likely to increase credibility with policy clients." These decades-old postulates can serve as a refreshing blueprint for the development, presentation, and analysis of information and solutions to problems. Define the "policymakers" primary concern. Seek intellectual rigor, and strive to never bring personal agenda or bias to the task. Seek advice and test other’s hypotheses. Take responsibility and credit as a group. Hold yourself to the highest standards of professionalism and excellence in your field. Admit mistakes and be quick to respond to, and correct, them. I am in the process of developing a new resource that will contribute to the effectiveness and efficiency of fire plans review. I would greatly appreciate your assistance in this. If you would like to contribute, please answer the (2) question survey below. Are you reading Medium? Medium is a publishing platform "taps into the brains of the world’s most insightful writers, thinkers, and storytellers to bring you the smartest takes on topics that matter. So whatever your interest, you can always find fresh thinking and unique perspectives." Five Lessons from, "A Message to Garcia"
NFPA 1403 - Can You Handle It? Answers to the most common questions and concerns for fire sprinkler system design. This book is not intended to be a comprehensive manual on fire sprinkler design, rather it is a brief guide that serves to answer the most common questions and concerns regarding the design of fire sprinkler systems. 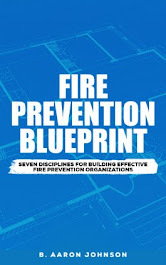 This book provides the fire plan reviewer or inspector with easily accessible answers to the most important questions for approval and acceptance of a fire sprinkler system. Does the structure require a fire sprinkler system? Is the occupancy and commodity properly classified? Are plastics properly identified and protected? Does the rack storage need in-rack sprinklers? Will there be any obstructions to the discharge pattern? How are the cloud ceilings protected? What is the "small room" rule? 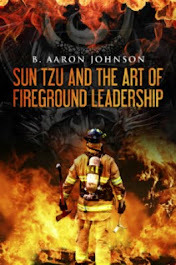 This book is written by Aaron Johnson from, TheCodeCoach.com and illustrated by Joseph Meyer from, MeyerFire.com. 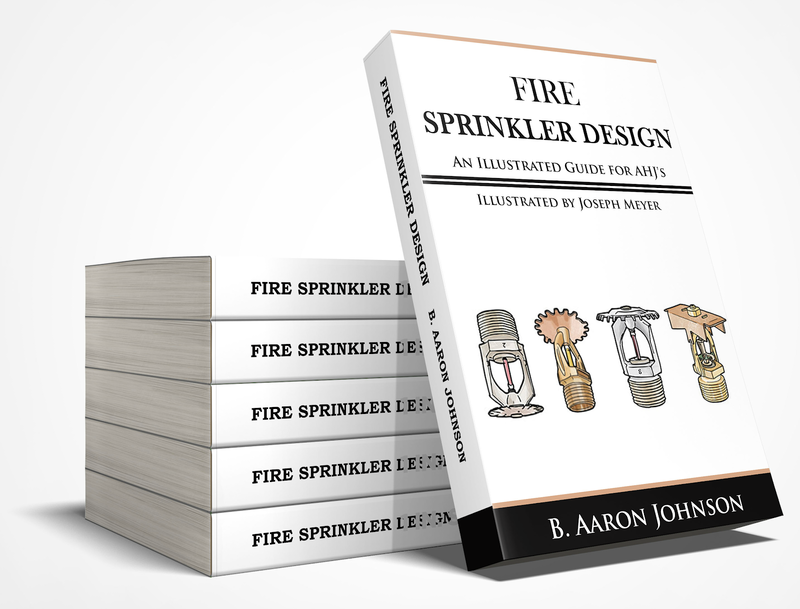 An illustrated guide for fire sprinkler design. Create better educated fire protection professional for the promotion of fire protection and life safety. After twelve years in the fire service and ten years of writing on fire prevention and fire protection topics, there are a handful of sprinkler design elements and questions that continue to show up. 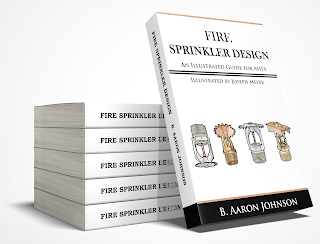 This book is not intended to be an exhaustive or fully comprehensive manual on fire sprinkler design, rather it is a brief guide that serves to answer the most commonly seen questions regarding fire sprinkler systems and design. Often times, reading the codes and standards language as written can be somewhat confusing. Our attempt in this manual is to provide clarity on a selection of these complicated design rules. Always, the main goal being a better educated fire protection professional to promote fire protection and life safety. It has been my great privilege to partner with the premiere fire protection engineering author and illustrator, Joseph Meyer. His drawing and illustration talents bring a fresh dimension to the fire protection system design principles we want to share in these pages. 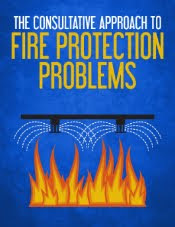 Through the combined efforts of our written content and Joe’s illustrations we hope to bring a better understanding to the art of fire protection and sprinkler design.